Can you believe it is May? I am super excited for the warmer weather and longer days. Of course, being that I love Mexican food, I am also really excited for Cinco de Mayo too. This year, we will be having tons of our favorites like sangria, chips, salsa, and guacamole. 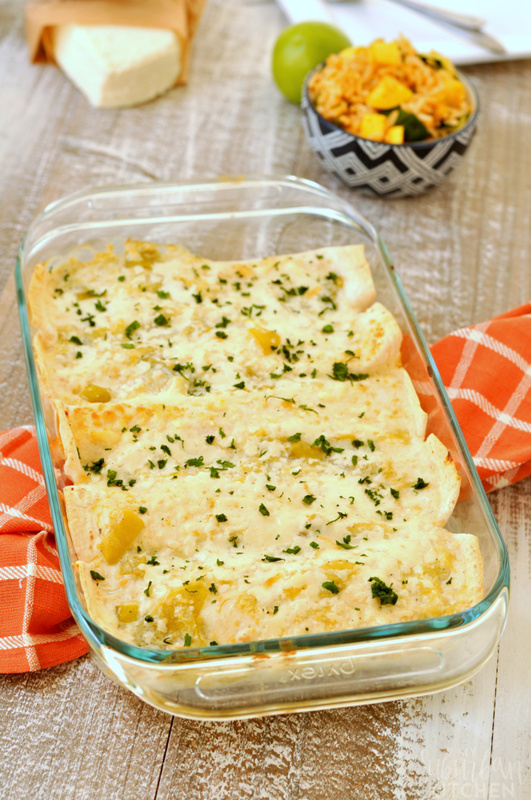 For dinner, I will be making chicken and summer squash enchiladas. 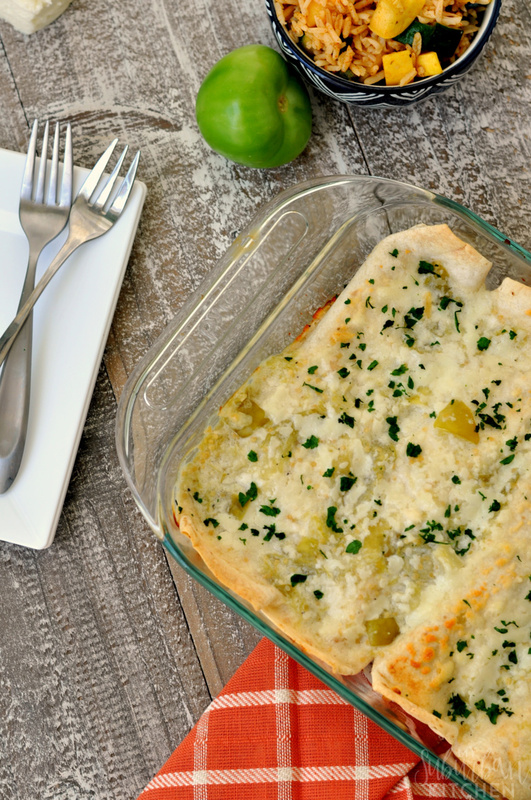 I love these enchiladas because they take advantage of the fresh summer produce that is available during the month of May. I used both zucchini and yellow squash in my enchiladas but you can choose just one if you prefer. 1. Preheat oven to 425 degrees. Spray a 9×13 casserole dish with nonstick cooking spray. 2. In a medium pan, heat 2 tsp oil over medium high heat. Add tomatillos and garlic. Season with salt and pepper. Cook for 1-2 minutes. Add 1 1/2 Tbsp water and cook for 8-10 minutes, smashing tomatillos during cooking. Remove from heat and stir in 1/4 cup sour cream and 1 Tbsp lime juice. 3. In a medium skillet, heat 2 tsp oil of oil over medium heat. Add squash, zucchini, poblano pepper and all of the spices. Cook, stirring frequently, for 5-7 minutes. 4. In a medium bowl, combine rice, cooked squash mixture and shredded chicken. Stir well. 5. Spoon a small amount of the tomatillo sauce into the bottom of the prepared pan. Divide rice mixture between tortillas and roll each one up and place in prepared baking sheet. Pour remaining tomatillo sauce on top of tortillas. Sprinkle cheese on top. 6. Bake in preheated oven for 15 minutes. Remove from oven and top with chopped cilantro if desired. What are you planning to make for Cinco de Mayo? Preheat oven to 425 degrees. Spray a 9x13 casserole dish with nonstick cooking spray. In a medium saucepan, heat 2 tsp oil over medium high heat. Add tomatillos and garlic. Season with salt and pepper. Cook for 1-2 minutes. Add 1 1/2 Tbsp water and cook for 8-10 minutes, smashing tomatillos during cooking. Remove from heat and stir in 1/4 cup sour cream and 1 Tbsp lime juice. In a medium skillet, heat 2 tsp oil of oil over medium heat. Add squash, zucchini, poblano pepper and all of the spices. Cook, stirring frequently, for 5-7 minutes. In a medium bowl, combine rice, cooked squash mixture and shredded chicken. Stir well. Spoon a small amount of the tomatillo sauce into the bottom of the prepared pan. Divide rice mixture between tortillas and roll each one up and place in prepared baking sheet. Pour remaining tomatillo sauce on top of tortillas. Sprinkle cheese on top. Bake in preheated oven for 15 minutes. Remove from oven and top with chopped cilantro if desired. I love Mexican food, so this makes me want to drop by for dinner 🙂 Thanks for sharing this at the Dishing It & Digging It Link party. Hope you had fun. Oh.m y! That looks delicious! Thanks for sharing! 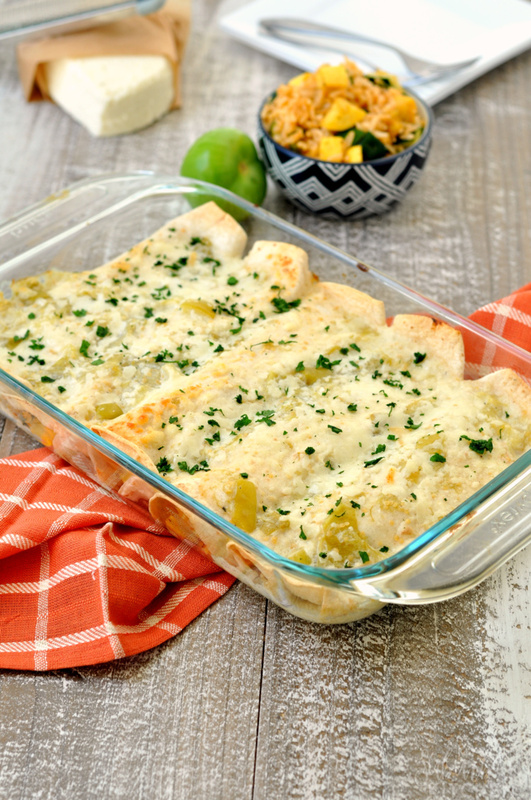 We will love these awesome enchiladas! Hope you are having a fantastic week and thanks so much for sharing with us at Full Plate Thursday. We will look forward to seeing you again real soon!